Young women rise in Zimbabwe. 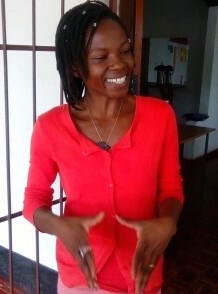 In 2009, Glanis Changachirere founded the Institute for Young Women Development (IYWD), a vibrant young feminist organization in Zimbabwe. Glanis first became involved in women’s rights when she herself wanted an education. She was born in a rural agricultural family, one of 12 children whose father didn’t see the value in investing in her schooling. From the beginning, Glanis’ path as an activist has not been easy. She defied cultural norms and enrolled in university where she joined the Student Representatives’ Council as the only woman. Glanis was arrested several times for “fighting for and representing student rights.” She wasn’t deterred. Her fight was for the right of all young women to get an education. Many young women are concerned, angry, and organizing around gender-based violence, household and economic insecurity, systemic oppression—all factors, among others, which impact their lives. The last few years, however, has seen a resurgence of young women coming together. This emerging movement is building on the courage of the previous generation of women’s rights leaders in Zimbabwe who continue to inspire the fight for justice. Zimbabwe’s new constitution, approved in 2013, includes some strong provisions that protect women’s rights: the right to equal pay, to personal security, and the right to be free from gender-based violence. It also guarantees appointments of women to governmental positions. These constitutional provisions were proud achievements for Zimbabwe’s women’s movement, which eagerly engaged with the national consultative process. Now the hard work has begun to ensure that these provisions are implemented. That’s why IYWD is dedicated to amplifying young women’s voices in democratic processes. They’ve launched an awareness campaign about the importance of supporting women’s leadership, as well as a program to familiarize young women with their constitutional rights. Many young women contend with limited access to education, resources, and income—creating a financial dependency. In response, IYWD promotes entrepreneurialism among young women to support themselves. One innovative income-generating initiative is a fish farming project. IYWD provides training, mentorship and market linkages. Operated as a collective, the young women are earning an income which is one step to addressing issues of financial dependency. IYWD believes that young women’s voices need to be represented in all spaces—in the family, community, at the village level, and in national discourse. Although change certainly does not happen overnight, IYWD has made impressive progress in just a few short years. The young women of IYWD are stepping into their power as leaders and game changers. Through a collaborative approach, the members of IYWD are mobilizing and building their capacity on human rights, equality, and entrepreneurship skills. And they’re pushing for more equitable policy and challenging the status quo. One example is a group of young rural women who, through an IYWD committee, challenged religious doctrines that discourage them from participating in public gatherings. Through mobilizing and organizing, the members of IYWD were able to end this practice in their community. IYWD is also working towards eradicating violence and discrimination against women—an arduous task that demands hands-on training and mobilization. We support our partners, including IYWD, because they are the ones who are building power to bring about social transformation. They’re building local skills and capacities, linking and mobilizing resources, and implementing innovative practices which are working towards justice. With more resources and support, organizations like IYWD can continue to be powerful agents for lasting, transformative change—the kind of change that amplifies the power of women and ensures that every woman can determine their future.